Hashtags can boost impressions, improve the searchability of your content, and encourage more people to talk about your brand. But to use hashtags effectively, you must do more than just plug them into your tweets on Twitter or posts on Instagram, Facebook or another social network. Here’s what you need to know to use hashtag marketing better as part of your overall small business marketing strategy. What is a hashtag and how do you use it? Hashtags are used to categorize content. When a person adds a hashtag to their post, that hashtag is indexed by social networks and the content becomes more easily searchable and discoverable by others. For example, if a person clicks on the hashtag #purplemarkers, they’ll typically see a page that aggregates all content with the same hashtag. Some social media platforms allow people to follow hashtags. So, any posts labeled with that hashtag will appear in the feed of people following that hashtag. Hashtag marketing is the practice of using hashtags strategically to help your content reach your intended audience. Choosing the right hashtags for a post can help it to sky-rocket in popularity – gaining your content views, likes, retweets, and shares. All of this social activity ultimately helps to give your content and your business exposure. But, not all hashtags are created equal. And different types of hashtags reach different audiences – accomplishing different goals for your business. These are the types of hashtags your small business should know and keep handy in your marketing tool bag. A trending hashtag is a hashtag related to a trending topic or event. Starting a new hashtag and helping it grow requires more work than simply taking part in a larger conversation that is enjoying a moment of popularity. While trending hashtags can’t be relied on for long-term engagement, they are great for seizing the moment and capitalizing on a brief, but intensely popular topic. Tip: Pair trending hashtags with content linked to that trending topic or event to help reach a new audience your business may not ordinarily reach. Looking for ways to ease into hashtag marketing? Niche hashtags for existing communities, fields and industries are great choices. Start by searching what hashtags your competitors and industry influencers are using. If you’re not sure how to find relevant hashtags, use tools like Ritetag or Hashtagify. If your business serves a unique niche community, follow popular influencers in that community and track what hashtags they use. Tip: Target your most active consumer groups using appropriate hashtags linked to relevant content. This will ensure that your content reaches your most valuable audience. 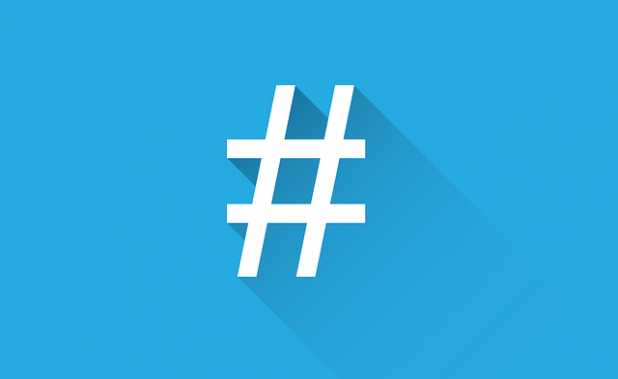 Branded hashtags are hashtags created by your business to represent your brand. These hashtags require a bit more work to get off the ground. They rely on your own marketing to build momentum instead of piggybacking off of an established trending topic or campaign. But, creating a hashtag for your business is well worth it. When done right, these hashtags serve as a direct pipeline for people to find content specifically related to your brand. The simplest version of a branded hashtag is your business name (#starbucks, #ikea). But, you can also get a bit more creative. Think of examples like #EsuranceSave30 or #DigiorNoYouDidn’t. Tip: You can include a branded hashtag to nearly any content you post on any platform to help increase exposure. Does your business offer a wide range of products or services? Product or service hashtags can help consumers do research on a product. If a company offers multiple products, it can be troublesome to sift through many photos just to find the few you may be interested in. A company may use both a branded hashtag and a product hashtag in a post. These hashtags also give customers a tool to become advocates and proclaim their love for your product or service in a meaningful way. Tip: Include the appropriate targeted hashtag on any content related to that product or service. A concise call-to-action hashtag can be a wonderfully effective marketing tool. Coke’s #ShareACoke campaign and Charmin’s #TweetFromTheSeat are examples of tremendously successful hashtag campaigns. They worked because they capitalized on the social nature of social media and related back to their brand in a natural way. Tip: Only use these call-to-action hashtags on posts specifically related to that campaign, otherwise, you risk diluting the impact. Ultimately, there is no one “right” type of hashtag to use to boost your social media posts. Choose the right hashtag for the content and audience you want to reach.